from the East (Asheville/Charlotte) Take I-40 West to exit 20, (Maggie Valley) 276 South. Take 276 South to U.S. 19 (at the traffic light turn right). Just past the Maggie Valley Inn on the right is a Shell station. 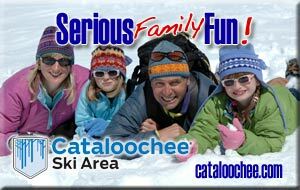 Call us from there at 828-926-5259 and we will meet you and take you to the property. from the West (Knoxville) Take I-40 East to exit 20, 276 South. Take 276 south to U.S.19 South (at the traffic light turn right). Just past the Maggie ValleybInn on the right is a Shell station. Call us from there at 828-926-5259 and we will meet you and take you to the property. 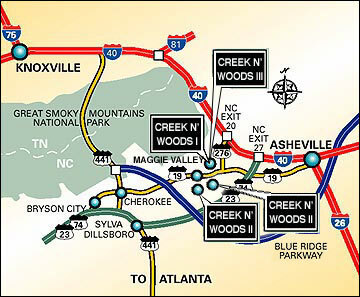 from the North West (Cherokee) Take U.S. 441 South to U.S. 19 North (Maggie Valley) Go through Maggie Valley and on the left, just before Hwy 276 south is a Shell station. Call us from there at 828-926-5259 and we will meet you and take you to the property. from the Atlanta area and points south Take U.S. 441 to U.S. 23 exiting in the city of Waynesville (exit 102B). Take 276 North to U.S. 19 South (turn left). Stay on 19 and go thru the intersection of Hwy. 276 South, and just past the Maggie Valey Inn on the right is a Shell station. 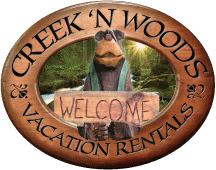 Call us from there at 828-926-5259 and we will meet you and take you to the property.